You need to mix cold heavy cream and the flavor you want in a bowl. The cream should be pasteurized to the right extent. 1 – 2 tsp of vanilla extract is very good for 1 cup of cream. You can add 1 -2 tbsp of sugar equivalent to the mixture. You can also use chocolate or mint flavor instead of vanilla. Place your bowl in a larger bowl of ice to keep cool. 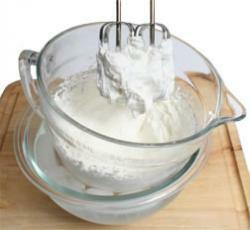 You can either use a standing mixer with whisk attachment or an electric hand mixer to beat the cream. The result will be the same; the only change is that it might take a bit longer in one process. Set the mixer on “low” first or else you will have cream and milk spattered all over the place. Set the mixer so that the froth builds up slowly and there is no splashing. You can now see the froth building up. Hasten up the process by setting the mixer on “high”. Try to get a soft peak which should bend over when you remove the whisk. Make sure that you don’t overdo it and turn the cream into butter. You can also beat the cream first and then add the flavorings at this stage. You can get a vanilla taste by adding vanilla extract. 2 tbsp of cocoa will give you the chocolate taste. Similarly, you can add 2 tsp of instant coffee granules to get the coffee taste. You can also go to the extent of adding a tbsp of your favorite liquor if you want the taste. If you want really good whipped cream, then take cream with higher butter fat content. You will be able to get about 2 cups of whipped cream from 1 cup of good quality cream. If the cream starts to become less frothy, you can whip it up again. You can keep the whipped cream in the fridge and use it for various purposes. This entry was posted on November 23, 2010 at 4:34 pm and is filed under Uncategorized. You can follow any responses to this entry through the RSS 2.0 feed. You can leave a response, or trackback from your own site.